To enable Foldr to function correctly, search the directory service and also provide more advanced capabilities such as password change control and file sharing, the Foldr administrator must provide the system with domain based service accounts. Multiple service accounts can be configured within Appliance >> Service Accounts. Have the ‘password never expires’ flag enabled. Have the minimum permissions required to enable correct functionality. The main system service account is used by Foldr to Search the domain and also to control password changes for users, if this option is enabled. A standard account that is solely a member of ‘Domain Users’ has sufficient privileges to perform these actions. 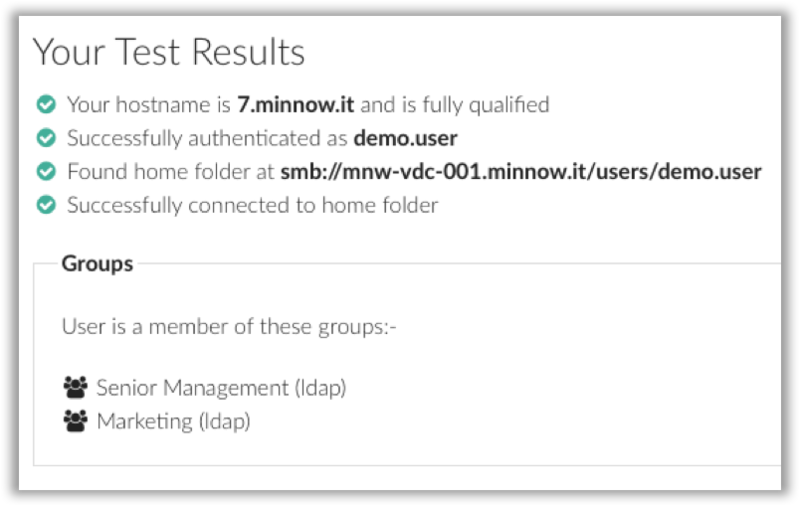 Now that the appliance has been configured to authenticate against Active Directory (or other LDAP service) and a service account has been created / selected, you can test authentication using the ‘Test Settings’ tab found within General >> Test Settings. If there is an issue with any step in this process it will be highlighted by the test procedure.